CIUDADANO, COMUNIDAD CIENTÍFICA Y PÚBLICO EN GENERAL. VEHICULOS QUE CONFORMAN EL PARQUE AUTOMOTOR DE COLCIENCIAS. PROPIEDAD INTELECTUAL Y TRANSFERENCIA TECNOLÓGICA. FOTOGRAFÍAS EN LOS DIFERENTES EVENTOS DE COLCIENCIAS. 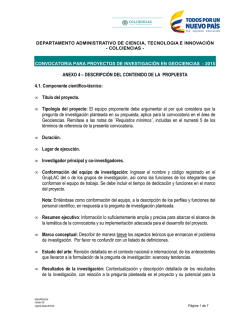 APROPIACIÓN SOCIAL DE CIENCIA, TECNOLOGÍA E INNOVACIÓN - CTeI. INNOVACIÓN Y DESARROLLO TECNOLÓGICO DE COLCIENCIAS. 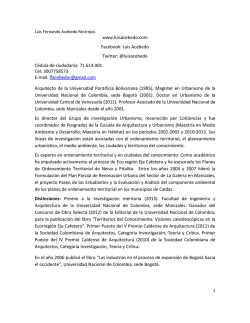 CONVOCATORIA 656 DE 2014 DE COLCIENCIAS. REQUERIDAS SEGÚN EL PLAN DE COMUNICACIONES DE LA ENTIDAD. 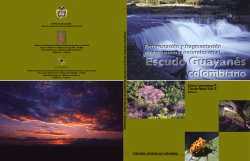 PROGRAMA NACIONAL DE BIOTECNOLOGÍA DE COLCIENCIAS. EL ÍNDICE BIBLIOGRÁFICO NACIONAL - IBN. DE ALTO NIVEL PARA LAS REGIONES. CIUDADANO, A LA COMUNIDAD CIENTÍFICA Y EL PÚBLICO EN GENERAL. QUE RESULTEN DURANTE EL DESARROLLO DE LAS MISMAS. 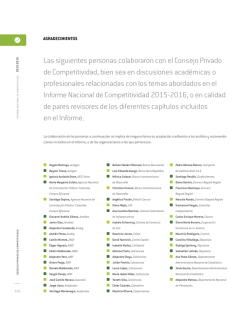 ACTIVIDADES Y ACTUALIZACIÓN DE PROCESO DE GESTIÓN DE CALIDAD. DE 2014 - PROGRAMA " ES TIEMPO DE VOLVER"
FINANCIERA DE LOS CONTRATOS Y CONVENIOS DE LA ENTIDAD. DIFERENTES ÁREAS Y SUS COMUNIDADES. INFORMATIVOS POR LOS DIFERENTES CANALES DIGITALES DE LA ENTIDAD. 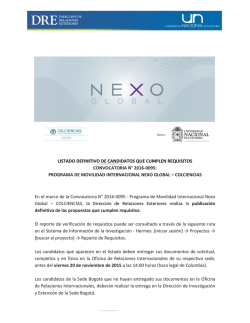 LA CUAL FORMA PARTE INTEGRAL DEL PRESENTE CONTRATO. EVALUACIÓN INTEGRAL DE LOS MISMOS. LIQUIDACIÓN DE CONTRATOS Y/O CONVENIOS. TECNOLOGÍA E INNOVACIÓN DE COLCIENCIAS. APROPIACIÓN SOCIAL DE LA CIENCIA LA TECNOLOGÍA Y LA INNOVACIÓN.